The latest superhero teamup, a concept that has grown less novel since the first Avengers four years ago, Captain America: Civil War packs a lot of stuff into its 146 minute running time. To be sure, there are things here that do work, but after a certain point it also ends up feeling like too much of a good thing. The story is set in motion when Scarlet Witch (Elizabeth Olsen) accidentally kills civilians in her attempts to stop a suicide bomber, leading the government to draw up new legislation to regulate superheroes under a United Nations committee. This evokes internal conflict within the Avengers, with Iron Man (Robert Downey Jr.) supporting the motion, and Captain America (Chris Evans) opposed to it, questioning how government power that would force them to follow orders could easily be abused. When Winter Solider Bucky Barnes (Sebastian Stan), Captain America’s old army buddy who has been brainwashed by Hydra, becomes the prime suspect in an explosion in Nigeria, the team breaks apart and starts taking sides in how to best address the threat. The film starts off on a promising note, with an intriguing espionage vibe that feels more in line with James Bond, and there are some interesting themes explored in the story. There are also compelling undertones to the infighting between Captain America, Iron Man and Bucky Barnes, especially when more of their history is revealed in the last act. When Captain America: Civil War does hit its stride, including during some well staged set pieces, the film becomes a lot of fun. This includes an extended apartment sequence that introduces us to the new Spider-Man. Tom Holland refreshingly plays him like an excitable teenager, and it shows great promise for the upcoming standalone film. Black Panther (Chadwick Boseman) is also a solid addition to the team, an African king who dons a clawed suit and has personal reasons to seek revenge for the Nigerian attack. Ant-Man (Paul Rudd) injects some of the most delightful moments into an otherwise over the top airport smackdown between the colliding superheroes, in his first time appearing with the team. But Captain America: Civil War also juggles too many characters, and there are some pacing issues and tonal challenges that come from bringing this many story strands together. For me, the film never quite coalesced into a complete whole, and sometimes felt more like a series of sequences. It spends too much time on buildup and setting the stage for even further chapters, that it can’t quite live up to the potential of its story, and never really locks down a single plot that can be meaningfully resolved within the film. I kept wanting it to be more of a Captain America movie and less of an Avengers one, and I kind of wish the studio would go back to exploring these characters on their own in more solo adventures. Although this instalment doesn’t pack the same punch as Captain America: The Winter Soldier, which for my money remains Marvel’s best, it’s still a pretty good piece of this much larger machine that is more successful at continuing the story than last year’s messy Avengers: Age of Ultron. The ever expanding cast continues to play well together, both in sparring matches and when spouting one-liners, with their performances and interactions remaining key to this franchise’s entertainment value. 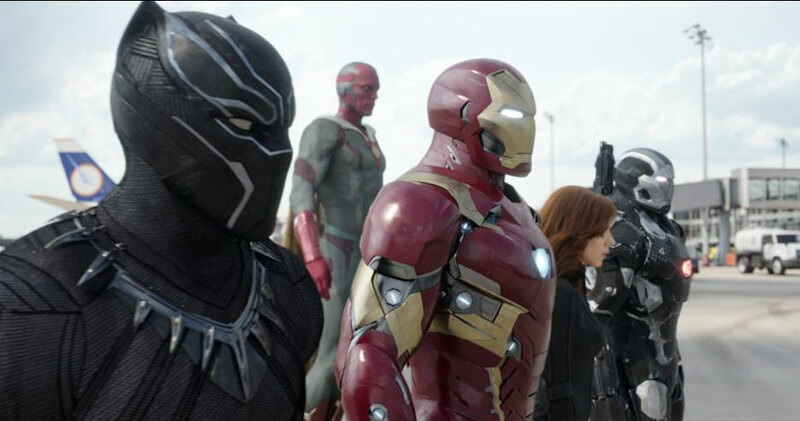 Put simply, Captain America: Civil War is far from a great movie like The Winter Soldier, but it’s still a pretty good summer blockbuster that offers enough entertaining sequences and interesting storylines to make it worth seeing, especially for fans who may take to it even more than I did. Based on the Civil War storyline from the comics, Captain America: Civil War is the follow up to the highly acclaimed and successful Winter Soldier – a film that still easily ranks as one of the best Marvel films to date. When the film opens, a mission by the Avengers that causes more destruction to metropolitan areas like in New York and Sokovia, causes governments of the world to create an accord that would regulate their activities and deployment. While Iron Man agrees with this, Captain America does not and the in-fighting begins. I was quite looking forward to this follow up, since after what I considered a disappointment with Avengers: Age of Ulton last year I had hoped this would be a return to the style of The Winter Soldier. While there are moments here that hint at a greater story (with Captain America, Winter Solider, Iron Man, and Black Panther) there is also a lot of muddling character development that I felt would have been better suited for the next Avengers instalment than Captain America 3. And it’s unfortunate, because it means that what really worked in Winter Soldier is quite buried here with too many characters to really focus fully on the ones who should be at the core of the story. In particular, scenes that focus solely on Scarlet Witch and Vision, come to mind. Overall, I enjoyed the film, and found it to be entertaining. However, the central storyline between Captain America and Iron Man, that leads to the Civil War and further division caused by the Winter Soldier’s reappearance, really should have been given a bit more time. In terms of the technicals, while there were some quite good sequences, most of the action never felt inherently fresh to me, and the 3D felt unneeded and made the film look quite dimly lit at times. Still, for fans of the Marvel films, it is worth seeing – better than Ulton, not as good as Winter Soldier – but fun nonetheless. Just perhaps pick a 2D showing. Captain America: Civil War is the third Captain America title in the Marvel series, though except for a couple of missing players and the threat coming from Hydra rather than aliens, it might also be considered an Avengers film. Casual viewers not immersed in the comic book tales would benefit, as I did, from not only seeing the previous films but also reading over their plot synopses before seeing this one, if only to get all the real names and superhero names straight. In an opening flashback scene we see how Bucky Barnes (Sebastian Stan), the former WWII army buddy of Steve Rogers/Captain America (Chris Evans), was triggered by a series of random Russian words to carry out assassinations for Hydra as the enhanced Winter Soldier. 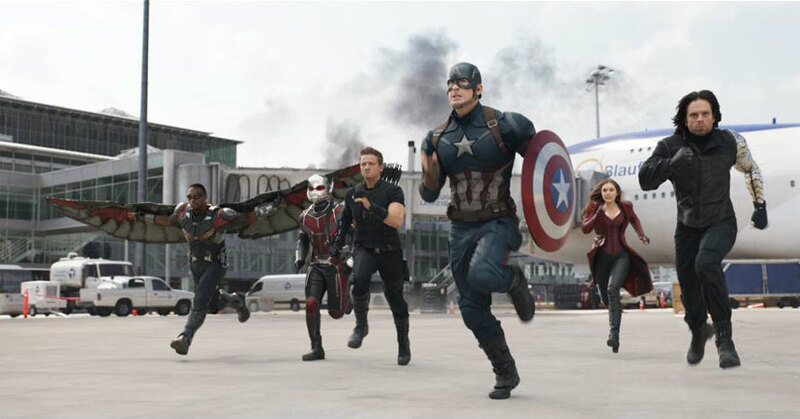 The next scene shows current Avengers: Captain America, Black Widow (Scarlett Johansson), Scarlet Witch (Elizabeth Olsen), Vision (Paul Bettany), War Machine (Don Cheadle), and Falcon (Anthony Mackie) in a fight with Hydra villain Brock Rumlow (Frank Grillo) and his team, which causes collateral damage in Lagos, Nigeria. As a result, General Ross orders the Avengers to be placed under the control of a UN team, to which some led by Tony Stark agree but others led by Steve Rogers do not, leading to the so-called civil war that will result in fights that hopefully would not result in the death of any of them. When Barnes is implicated in an explosion, Steve Rogers goes after him, putting himself and his allies on the wrong side of the law. There are others chasing the Winter Soldier including the enhanced Black Panther (Chadwick Boseman) and a mysterious spy (Daniel Brühl), leading to a lot of action and soul-searching that make the rest of the film worth seeing, with a few surprises including other Avengers along the way. 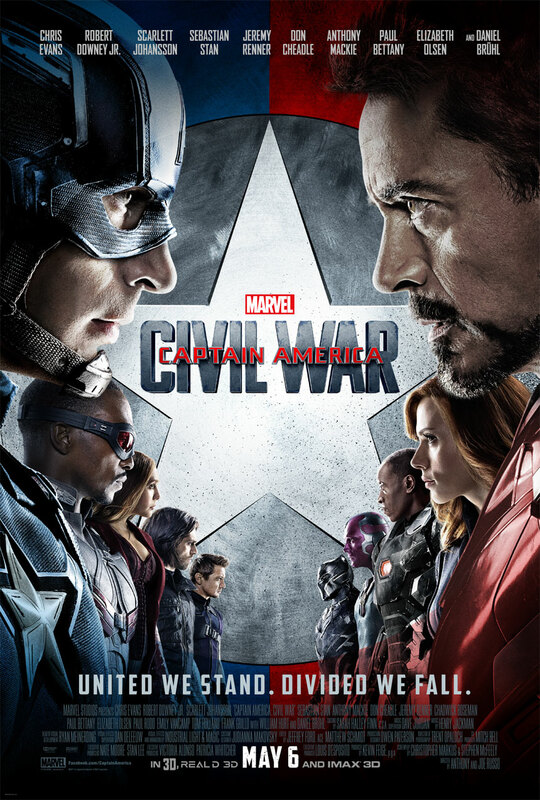 Directed by the Russo brothers, Captain America: Civil War is a worthy sequel in the Marvel universe, with a good balance between action, plot and character development and some nice comic script touches carried by a fine cast that carry us along its (longest yet) 146 minute running time at a good pace, providing the viewer (as stated above) is well prepared to keep up with it.